Tortola, Peter Island, Anegada, Virgin Gorda, The Baths, Marina Cay, Cooper Island, The Indians, Norman Island, and more! Come experience the amazing waters and islands of the Caribbean British Virgin Islands with an outstanding crew dedicated to providing you the very best experience possible. 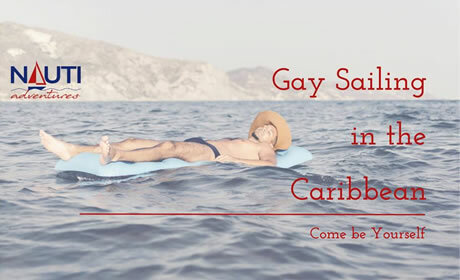 Take part in as much of the gay sailing cruise fun as you want or sit back, grab a cocktail and enjoy the view with the other gay men aboard. If you are looking for a somewhat remote pure paradise for your next vacation aboard an all-inclusive gay sailing charter, then the British Virgin Islands are your answer! The British Virgin Islands are among the world’s most popular sailing destinations and you only have to look around to understand why. Laid-back and low-key, the BVIs are flat-out gorgeous to sail and explore. Hop aboard our state-of-the-art catamaran and discover secluded coves, impossibly beautiful snorkelling spots, and breathtaking islands virtually untouched by humans. Location may not be everything but in the British Virgin Islands it's what makes cruising so pleasurable. With its stretch of islands in the northeastern part of the Caribbean, guests can expect beautiful blue waters flowing into shaded caves and onto soft-sand beaches. Coral reefs surround the coast in an array of colors and are home to just as colorful marine life. Further inland bars, shops and restaurants spill through the winding streets and timeless villages are filled with the famous laid-back island ambiance. Our voyage start on Saturday at 2pm and ends the following Saturday morning. Boarding starts any time after 2 pm, with a Pain Killer cocktail served up to wash away your travels! Before we launch and head to our first anchorage we will have a boat briefing to go over a few rules of the road and get everyone accommodated for their stay. After we are all settled in, we head out for an afternoon sail to one of the best bars in all BVI, Willy T’s! Now located at Peter Island, this is where we will anchor for our first night and do some jumping off the famous Willy T’s. Breakfast aboard followed by a full day of sailing to Anegada Island. This will be our longest voyage of the week, traveling some 38 nautical miles to our second anchorage. Well worth the trip to this beautiful, secluded paradise island. During our trip out, lunch will be provided aboard and hopefully, some fresh fish will be caught for dinner aboard. Breakfast aboard, followed by sightseeing on Anegada. A full day of beachcombing, snorkeling, lobster catching, and lunch on the island. We will remain at Anegada for the night, dinner will be aboard. Breakfast aboard, followed by a sail to Virgin Gorda Island. This is the playground for the rich and famous, you never know who you might see; Richard Branson? President Obama? Jimmy Buffett? Hopefully, we will rub elbows with the rich and famous, then hit up a couple beach bars, followed by dinner ashore at one of the fine restaurants in the area. Breakfast aboard, followed by a short trip to The Baths. Yes, we have showers on board, this is not that kind of bath! This day will be full of exploration through the huge granite boulder maze mother nature has sprinkled at the end of Virgin Gorda Island, called The Baths. Simply Amazing. 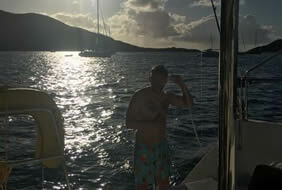 After The Baths we will have a short sail to our anchorage for the night and one of our favorite spots in BVI, Marina Cay. This is the home and original distillery location for Pusser's Rum. Breakfast aboard, followed by a few hours sail to Cooper Island for the day. This island boasts some of the very best reefs in the area. A perfect place to spend a day on the water. Lunch and dinner will be aboard. Breakfast aboard, followed by a short sail to The Indians! The Indians are an amazing rock formation, basically in the middle of the Islands, perfect for snorkeling and swimming with the sea life. By far the best stop in BVI! After a day of water-sports at The Indians, we will head into Norman Island for the last evening aboard. We will do our final dinner ashore at Pirates Bite, a beautiful outdoor restaurant overlooking the anchorage. Breakfast aboard, followed by a short motor sail back to port. We will have you back in port by 10 am, for your travels home. Flights can be taken out of BVI any time afternoon. As mentioned most of your food and beverages are included in your cruise fee. Once you are booked to sail with us, we will send you a welcome email, specific charter info, as well as a questionnaire for food and beverage preferences. Shuttle, taxi, and water taxi are the best ways to travel the Caribbean islands. We will include the best options for these and airlines in your Informational Welcome Email. Each Virgin Island location has it's own special travel circumstances. This is your adventure, make it what you'd like. We just ask that you respect the others guests aboard the charter, and while we are in ports and busy anchorages, you keep the important parts covered up. 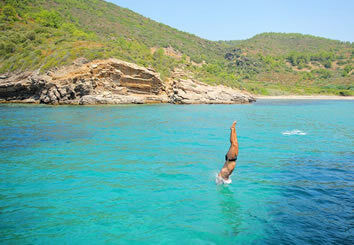 We will ensure you plenty of private time for sunbathing and swimming during our trip. This is an adventurous trip, we're sailing on the border of the Caribbean Sea and the Atlantic Ocean. There is a good possibility you could feel nauseous or end up getting sick. Plan ahead and you will have no problems. There are several motion sickness medications and applications available at your local drug store. Luckily you won't need much, a few outfits and swimsuits and you're golden. Other key items: bring whatever identification you will need to enter the region we are sailing. Ocean safe sunscreen is important and lots of it. Quick drying swimsuits are key and neoprene water socks for snorkeling and beachcombing are recommended. For your comfort and the protection of our boats, please try and bring soft-sided luggage, if you can. To help protect our environment, we encourage the use of ocean safe lotions and soaps. We hope you have the trip of a lifetime and you tell all your friends about your amazing adventure. We can guarantee many wonderful memories being made, plenty of relaxation and exploration. Lots of swimming, sailing, snorkeling, and beachcombing. Plus, whatever other gay shenanigans come up! 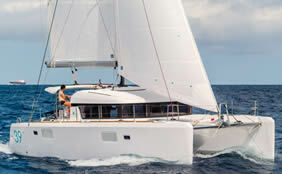 We will be sailing on luxury catamaran, no more than a few years old, but often brand new. The accommodations are plush and perfect for your sailing adventure. 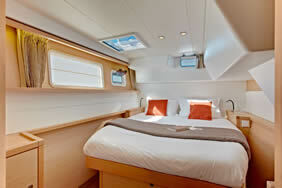 Each double booking will receive their own cabin, with queen sized bed and all the needed linens to go with it. Each cabin has lighting, windows with ventilation, a fan and some storage. 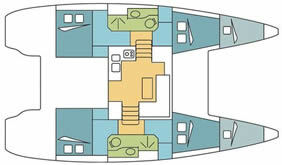 These boats feature two or more full bathrooms, plus an aft deck shower to bathe or rinse off in after a swim. Not so surprising, the aft deck shower is a real hit with the guys chartering and often involves much less clothing than shown! Other accommodations include a full kitchen, indoor and outdoor dining spaces, and comfy netting space between the hulls for watching the water and dolphins pass by. These boats are made for long range, ocean-bound voyages. You are in good hands and great accommodations during your stay! All-Inclusive, Cruise Only, Per Person, Double Occupancy. Nauti Adventures cruises are including the service of a gay skipper and a gay cook/co-skipper, accommodation on board, welcome drink, breakfast, lunch, dinner, harbor fees, taxes, gasoline and end cleaning. Not included: restaurant dinners, alcohol or crew gratuities.